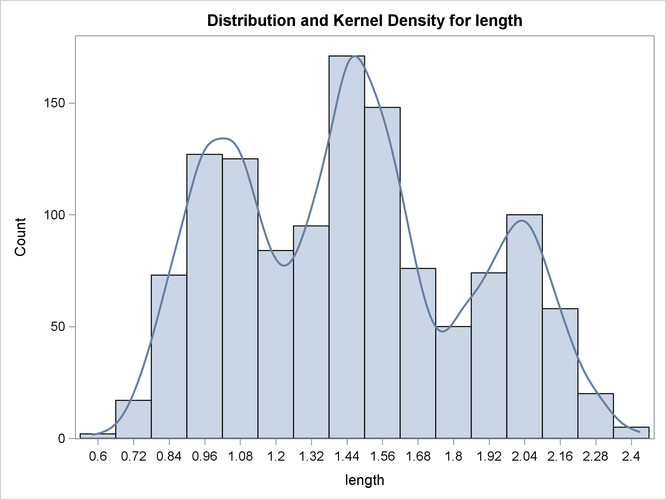 Because ODS Graphics is enabled, PROC KDE produces a histogram with an overlaid kernel density estimate by default, although the PLOTS= option is not specified. The resulting graph is shown in Output 66.1.1. For general information about ODS Graphics, see Chapter 21: Statistical Graphics Using ODS. For specific information about the graphics available in the KDE procedure, see the section ODS Graphics. The default output tables for this analysis are the "Inputs" and "Controls" tables, shown in Output 66.1.2. The "Inputs" table lists basic information about the density fit, including the input data set, the number of observations, the variable used, and the bandwidth method. The default bandwidth method is the Sheather-Jones plug-in. The "Controls" table lists the primary numbers controlling the kernel density fit. Here the default number of grid points is used and no adjustment is made to the default bandwidth.